This might sound a bit obsessive, but I keep a detailed time-log of all my working hours. It's a useful planning tool - I can work out which books are financially worthwhile and how long a proposed book will take. The time-log is an Excel spreadsheet; it has columns for each project I'm working on and one with the title Admin/Truffle-hunting. Truffle-hunting? 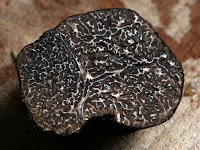 Truffle-hunting is the uncovering of valuable nuggets - facts, ideas, inspiration. It can look like procrastination. It can be reading a string of apparently useless websites, anything from Brainpickings to Buzzfeed and some that are clearly clickbait but some instinct says there might be something there. And all the truffles, the shiny things dug out of the mud and data-slurry of the web, are then stored away, suitably tagged, in Evernote. Just as the trufffle-hunting pig always has a nose even when not on a truffling mission, truffle-spotting isn't restricted to the hours on the time log. Reading the paper, talking to people, listening to Radio 4, all turn up the odd truffle unexpectedly. The knack is to recognise them and store them for later. They don't need to have an immediate use - it's just a matter of seeing their value. And truffles can look like a lump of mud, so spotting them is not always easy. My Evernote is a sort of cabinet of curiosities, stuffed with intriguing things, most unconnected, many with no obvious application, but all with intrinsic interest. In the old days, they went in notebooks. Evernote makes them easier to find, so as a working tool it's better. But whether you keep your truffles on the computer or on paper, it's worth valuing them. It doesn't matter if they get a bit old and dried out - you can soak them when you need to use them and they will be lively and plump again. Ideas are like that. Really must investigate Evernote. Good truffling,Anne! I must too - random scraps of paper lying about the place are too precarious for truffles! You have inspired me, Anne! Well - first of all - I have never coped with the fact that the kinds of truffles pigs snuffle out are not the chocolate ones. But, putting all this aside ( and munching on a square of green and gold for comfort) I think this is great. And yes, truffles come up in the most surprising places. I find that they appear more frequently when I'm in the zone and sort of thinking almost constantly about the WIP. Lovely post as always Anne.